This piece was inspired by a photograph on a greeting card I purchased in New Zealand. The gifted photographer, Fay Looney, gave me permission to recreate her image using textiles. To see more of Fay’s stunning photographs, visit her website. My challenge was to recreate this photograph using only fabrics in my “stash”. I met that challenge (except for the borders, which don’t count…). To create the very muted sky with the fabrics on hand, I used several overlays of polyester organza and tulle on top of a commercial sky fabric. I utilized the front and back of fabrics for the mountains and used overlays of tulle to tone down the value when it was too strong. The foliage in the front of the piece was accomplished using several dark green foliage fabrics and extensive machine embroidery. 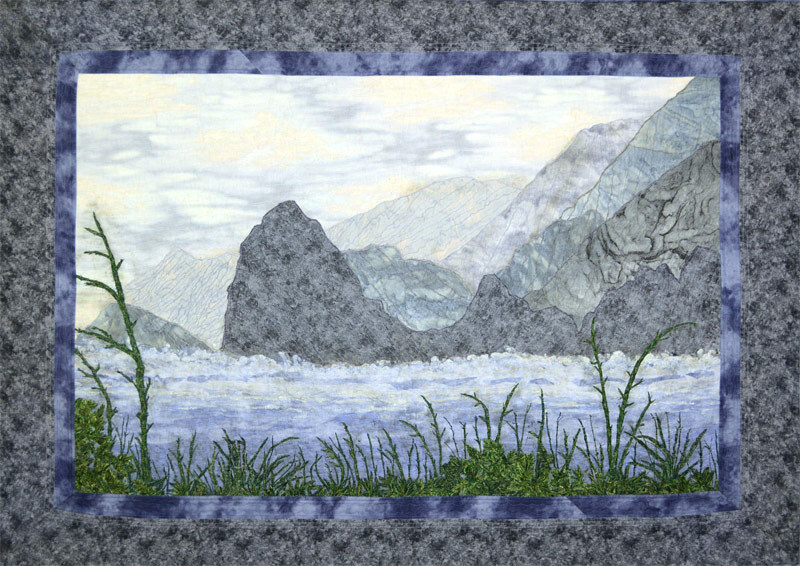 I fussy cut wavelike fabric and also used pearlized white textile paint for the waves on and near the rocks. The Shredded batting under tulle gives the impression of foam on water for the waves closer to the shore.